In general, the users found the Nike Flylon Train Dynamic to be comfortable for use in various activities. The unique style of the trainer was appreciated by many consumers. It was a recommended shoe for overall training by a good number of fitness enthusiasts. Plenty of owners liked the absence of a traditional lacing system as it made for a quick slip-on or slip-off action. The sock-like fit felt supportive during dynamic movements, according to numerous testers. Several wearers noted that the low-to-the-ground sole unit was steady during weight training. Some reviewers were pleased with the lightweight nature of the footwear. A few buyers claimed that the outsole provided excellent traction on most surfaces. A couple of commenters stated that the price was reasonable because of the shoe’s quality build. Some individuals thought that the upper was too tight, which made it tricky to put on or take off. A few users complained that a seam at the back rubbed their heel raw. A couple of people said that the upper was too stretchy to provide support. The sole had insufficient traction, according to one person. Another purchaser said that the strap was not durable. Overall, the Nike Flylon Train Dynamic was perceived as comfortable. The absence of a lace-up closure also gained the favor of numerous users. Many people appreciated its style and design. However, the sock-like fit made it tricky for some individuals to put on or remove the shoe. There were also complaints of blistering at the back of the foot. In the end, it was a recommended shoe for cross-training because it provided adequate support during dynamic workout routines. Designed as a lightweight cross-training shoe, the Nike Flylon Train Dynamic features technologies that deliver support during explosive movements. The engineered mesh upper envelopes the foot in a stretchy and breathable material that locks it down for a secure fit. It features the Dynamic Fit technology in the midfoot area. This structure wraps the arch and the sides of the foot for an enhanced lateral support. The midsole is made from a dual-density Phylon foam. This compound is low to the ground, which allows it to be steady. It also has shock-absorbing properties to keep the foot comfortable. The outsole features aggressive rubber pods that aim to enhance the traction. These disks facilitate quick changes in direction without losing grip. 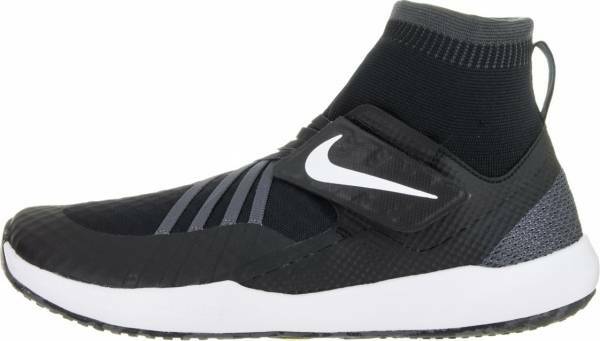 The Nike Flylon Train Dynamic is only available in men’s version and typically runs true to size. It comes in D - Medium width. The absence of a traditional adjustable throat and the tightly woven mesh used in the upper provide a snug fit. A rubber outsole lines the underside of the Nike Flylon Train Dynamic. This compound is durable and provides traction on most surfaces. It extends to the front and protects the toes from impact during training. Rubber discs are scattered throughout the outsole. These round components enhance the grip and make for a steadier platform during weight training. The Nike Flylon Train Dynamic utilizes a dual-density Phylon midsole. This material is made from the ethylene-vinyl acetate (EVA) foam pellets that have been compressed and heat-treated in a mold. The dual-density characteristic provides a firm perimeter that gives the sole unit its steady feel, while the center is soft to attenuate the force of impact with each step. Unlike most training shoes from Nike, the Flylon Train Dynamic features a mid-cut ankle construction which is reminiscent of a sock. The upper is made from an engineered mesh which gives it its stretchy property and enables users to wear or remove it quickly. The material is also breathable to keep the foot chamber ventilated during workouts. Synthetic overlays protect the high-wear areas to prevent the mesh from tearing. The shoe employs a unique closure. It utilizes the hook-and-loop strap tethered to the footwear by short laces. These laces pass through loops made by the Flywire, which are thin strings that function like the cables of a suspension bridge, creating a criss-cross pattern in the instep area to enhance the lateral strength of the upper when the strap is adjusted. The trainer uses the Dynamic Fit technology. Soft finger-like materials wrap the midfoot section starting from the arch and spread to the medial and lateral sides. The structure aims to provide a supportive element into the shoe.